As of Tuesday, July 2, the popular chain Mamma’s Pizza (310-MAMMA, www.mammaspizza.com), will be introducing 3 vegan pizzas to their menu using Daiya cheese! These delicious sounding pizzas include The Spicy Vegan (tomato sauce, vegan pepper jack cheese, bruschetta mix, green & black olives, sprinkled with chili flakes), Vegan Primavera (Tomato sauce, vegan mozzarella, spinach, sundried tomatoes, and marinated artichokes) and the Vegan Olive Press (olive oil, roasted Yukon Gold Potatoes, roasted red peppers, eggplant, broccoli, garlic and oregano). “We also offer a variety of vegetarian pizzas and veggie toppings, as well as vegetarian pastas.” Order by phone, or online. Find Mamma’s on Facebook, and look for the Mamma’s listing in the upcoming edition of the Vegetarian Directory 2014! Tutti Frutti (1500 Elgin Mills Rd. E., Unit 106, Richmond Hill, 647-693-3135), the world’s largest specialty frozen yogurt chain, is proud to present a new soy bean frozen yogurt! For those of you who love the idea of the self-serve frozen yogurt but were restrained by the dairy aspect, you’re in luck! “This great addition to our frozen yogurt products will not only be fat-free, it will be dairy-free as well. Try this with our new “Decaf Coffee Beans” topping if you would like an extra kick to your frozen yogurt. Enjoy!” As if you needed any more incentive, every time you buy soy bean frozen yogurt from Tutti Frutti, you support the “Real Green” project, which provides farmers in Afghanistan with soybean seeds and the education to cultivate the land and make a living. Check out their website, and find them on Facebook and Twitter for flavour updates! Foodbenders (2763 Dundas St. W., 647-303-2363) is a new is a fresh food kitchen offering “Healthy, fresh, epically delicious meals” in the Junction. “We offer ready-made salads, heat-up meals and other food products that are nutrition-oriented as well as superior in taste and freshness.” The carefully crafted menu includes the freshest, healthiest ingredients, including nature’s super foods, all sourced from organic, local, and/or fair trade farms. “The Foodbenders retail location serves express lunch from 10:30am-2:00pm, Monday-Friday, where you can grab on-the-go salads, sandwiches and heat-up meals. Foodbenders also offers delicious preservative and sugar free juices and smoothies, bottled salad dressings and sauces, jarred goods, dips and spreads, and other delicious health foods made fresh daily by the Foodbenders Chef. The seasonal menu is always changing, so keep checking in on Facebook and Twitter, as well as their website to see what’s on the menu today! Magic Oven (www.magicoven.com) has announced a new location in the Junction to open late this summer! 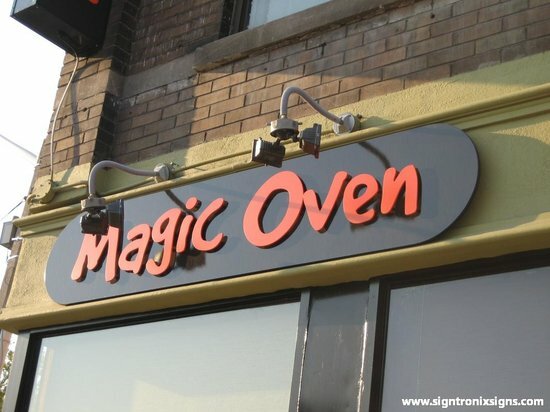 347 Keele Street (at Annette) will be the newest addition to the growing list of Magic Oven locations in the city. A two-storey space with a rooftop patio, this new location will be a beautiful setting to enjoy the over 50 vegan and vegetarian menu options! “Our one-of-a-kind ingredients combine local, organic and fair-trade ingredients to suit any diet. Visit our restaurants and experience a meal that’s truly ‘made to nourish your body and soul’.” Check in on their Facebook and Twitter pages for details on opening day, and tasting invites! Toronto Veg Card holders save 10%. Noah’s Natural Foods, one of Toronto’s iconic shops for all things healthy has opened a 5th location as of June 28. Located at 430 King St. (just e. of Spadina), the full service store will have all of the selection of the other locations, plus gluten-free options and prepared foods for take-out. Follow Noah’s on Facebook and Twitter for updates and specials, and go to their website for more locations. As we reported back in May, Bello Bio is moving from their Queen St. E. location, which is now closed, to 511 Mt. Pleasant Rd. (just N. of Davisville). The new location will feature a food shop and Toronto’s first Vegan Italian Eatery! “We will have all of the products you love and many many more which are all on their way from Italy as we speak. Our new location will have seating for 35+ and will feature Organic Vegan Italian cuisine such as pasta, pannini, salads, roasts, cutlets, desserts, etc., as well as organic coffee, teas and infusi (you’ll have to come to our new Eatery and Food Shop to see what this is). We will have a great take-out menu as well.” Check in on their Facebook page for the date of their grand opening! Organic Garage (579 Kerr St., Oakville, 905-849-1648) will be opening a new location in Vaughan as of the end of August at 8020 Bathurst St. Stay tuned to Facebook and Twitter for more details and an opening date. As we reported last month, Truly India (979 O’Connor Drive, 647-881-2651) has officially opened as of June 30! The inauguration party was a success, and they have new and delicious menu items, including a ton of vegan options! Enjoy a good Bollywood movie with your dinner? Then come to Truly India every Sunday between 5-8pm starting on July 7th for an all-u-can-eat-buffet & Bollywood movie! Check out Truly India on Facebook for information on upcoming screenings, and see their full menu on their website. Don’t forget- Toronto Veg Card holders save 10%! Everdale and Black Creek Community Farm (4929 Jane St.), Toronto’s largest urban farm, is hosting the Growing Change Field Supper. “Eat in the field where your supper was grown!” Proceeds to benefit the Black Creek Community Farm project: an urban farm that engages, educates and empowers diverse communities through the growing and sharing of food. Food provided by Cruda Café, Fresh City Farms, and many more! Find out more on Everdale.org. For anyone looking to get a Lick’s Nature Burger, select Lick’s Homeburgers & Ice Cream locations have been closed in and around the city. So far, locations at 1585 The Queensway, 1111 Dundas St. E. in Whitby, 1441 Upper James St. in Hamilton, and 2424 Lakeshore Rd. W. in Oakville have closed their doors, and there may be more closings to follow. Posted July 1, 2013 by Directory Coordinator. Filed under News, Veg Directory Updates.